Good Saturday morning, New Jersey! It was a windy, wet, and pretty wild night across the state, especially along the coast. Our coastal storm (nor'easter) isn't done quite yet. Here are a few updates as you start your day. A colorful warnings and advisories map for NJ. 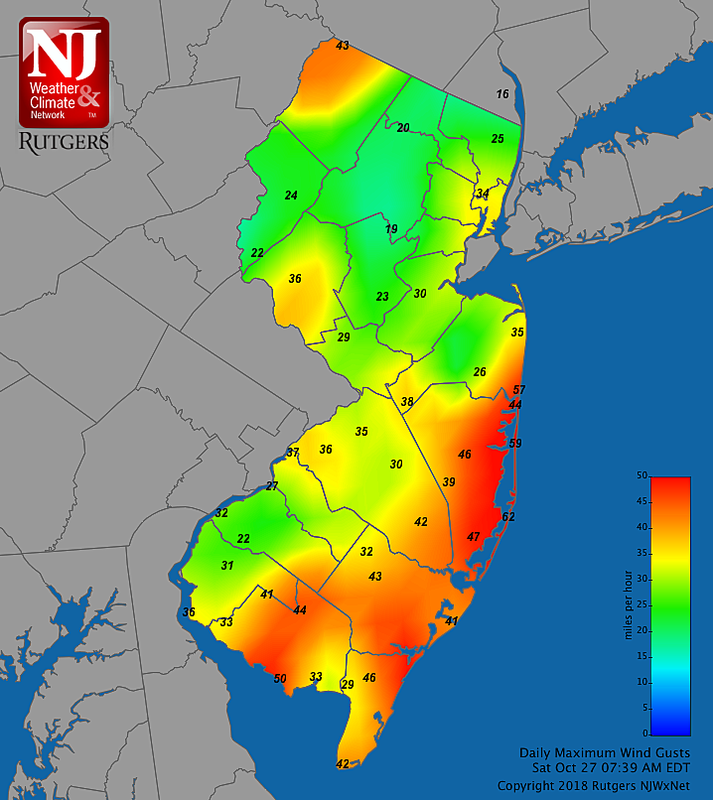 Along the coast, our wind forecast has (unfortunately) verified well. Further inland, gusts have been about 10 mph slower than expected. We're right in the period of peak winds as of this writing (7-8 a.m.) Power outages, downed tree limbs, driving difficulties, and airborne Halloween decorations will continue to be problems. Gusts will slowly subside as the morning presses on. I still think we'll transition from windy to breezy this afternoon. High tide is expected along the ocean Saturday morning between 9 and 10 a.m. Bays are forecast to peak as late as early afternoon. This is still the only high tide cycle that raises a significant flooding concern. Since the worst-case scenario wind forecast came true, I have every reason to believe the storm surge and coastal flooding forecast is on-track. 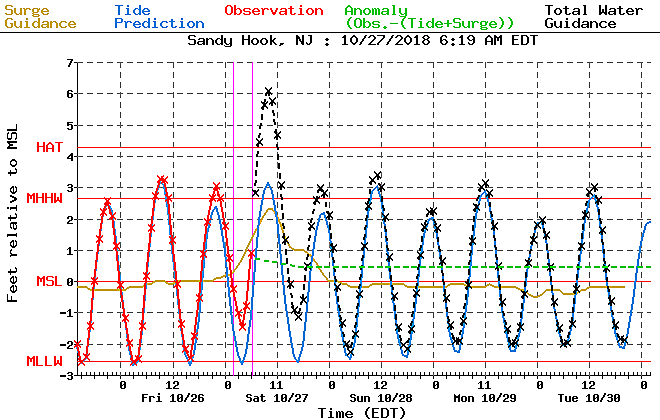 For the northern Jersey Shore — that's Ocean and Monmouth counties, including the Raritan Bay — 2 to 3 feet of surge will produce widespread moderate to localized major flooding during Saturday morning's high tide cycle. The southern coast — Atlantic and Cape May counties — will be minor to moderate flooding of tidal waterways. The waterways in northeastern New Jersey, along the Delaware Bay, and the Delaware River will experience some swell and minor flooding. 8+ foot ocean waves will also batter the beaches throughout Saturday, leading to some beach erosion and a high risk of dangerous rip currents. The heaviest, steadiest rain appears to be behind us now. Having said that, it's still going to be a wet and soggy day across New Jersey. Areas of rain should become more scattered and broken apart through this afternoon, largely exiting South Jersey by Saturday mid-afternoon. Showers will likely persist in North Jersey until late Saturday evening. Hopefully you're staying safe and sound, and will remain so until this nasty nor'easter leaves us alone. Sunday's weather is still looking much drier, calmer, and brighter — I think all the organizations that postponed outdoor events from Saturday to Sunday will be pleased with their decision. 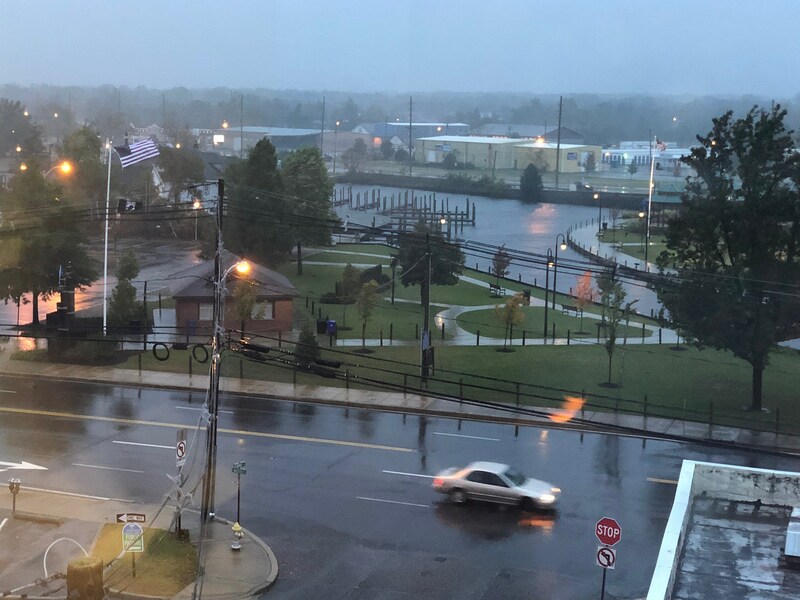 I do not anticipate another weather blog post about this coastal storm, but our news and traffic teams will continue to keep you updated on power outages, flooding, road closures, accidents, etc. The best way to stay informed is with our free mobile app, which will send instant notifications of critical information. You can also send us photos and videos of the storm, damage, flooding, etc. right through the app! Or via social media — it's extremely helpful to actually see what's happening across the Garden State.